Saw this article the other day.. and I have been totally consumed by the possibilities of cheap/safe and readlly available option for home owners.. Typically these containers sit and collect dust on our docks.. they can be picked up for $2000 for a 40" container. This seems like a perfect fit for projects like Habitat for Humanity and urban driven initiatives..and they can look good too... and I think cool designs could be easily developed w/ tools like this guy did w/ Google Sketch Up. ST. PETERSBURG, Fla. - This takes a little inside- and a whole lot of outside-the-box thinking. 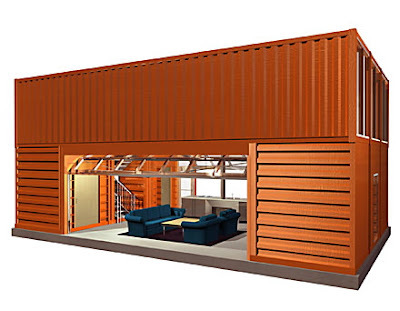 What looks like and lives like a house is actually a shipping container. Got My Ocean am I cool? Web 2.0 Awards or Web 2.0 Garbage ? It's about time Apple ..
Google Come to the Live Free or Die State ! !